The countdown is on to the kickoff of Maverick Stampede beginning Monday, Aug. 24. Faculty, staff, and student volunteers help new residents unpack and settle in during the Residence Hall Move-in Event on Monday, Aug. 24. Later that day is the Parent and Family Center Cookout and Late Night Shopping at Target. Don't miss MavsMeet Convocation at 4 p.m. Wednesday, Aug. 26, at College Park Center with comedian, actor, writer, and TV host Shayla Rivera as guest speaker. Stay around for live music, games, and fun at the AfterParty on The Green at College Park. Other Maverick Stampede events include Waffleopolis, Ask Me Days, the Maverick Cookout Featuring the Activity Fair Day, college and department socials, and much more. Read more about the Maverick Stampede schedule of events. UT Arlington and Texas Health Resources, one of the largest faith-based, nonprofit health systems in the United States, are collaborating to offer undergraduates pursuing medical careers a unique opportunity to experience a physician’s work firsthand. 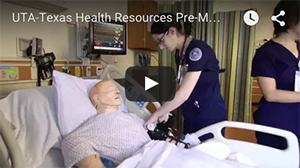 The Pre-Medical Student Preceptorship Program began as a pilot project in spring 2015 and formally launches this fall, pairing high-achieving students selected through a highly competitive process with physician-mentors in a hospital setting. Selected students participate in a six-week, for-credit course shadowing physicians at Texas Health Arlington Memorial Hospital in the operating room and in patient settings. Participants will analyze medical literature and present case studies to their physician-mentors for critique. They will meet with UT Arlington faculty members to evaluate, discuss, and enhance their clinical experience, including analyzing relevant published topics such as clinical trials, molecular research, ethical issues, patient experiences, and more. Read more about the UTA-THR Pre-Med Student Preceptorship. The system increases efficiency for customers and eliminates the need for parking decals and paper citations. MAVPark uses vehicle-mounted license plate readers to identify license plate numbers of parked vehicles for comparison against the virtual database of permitted vehicles. Faculty and staff can purchase general parking permits now. Reserved space permit renewals begin Saturday, Aug. 15. Beginning Tuesday, Sept. 1, e-citations may be issued for unpermitted vehicles parked on campus. The person who registered the vehicle will be notified by email or by mail. On July 15, the Office of the Texas Comptroller of Public Accounts was made aware of a fraudulent check scam in which criminals are using the name Texas Tuition Promise Fund to defraud the public. To participate, contact the Leadership Center at 817-272-6327 or utavolunteers@uta.edu. 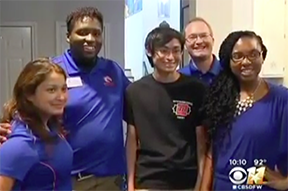 Super Service Saturday is coordinated by UTA Volunteers!, The Big Event, and Alternative Breaks and is sponsored by the Division of Student Affairs as part of Maverick Stampede. Tane Johnson's wish for an education began coming true when Make-A-Wish North Texas teamed with UT Arlington. The Arlington teen wants to study computer science engineering at UTA. He was accepted, and now his tuition and expenses for his first year are covered. Johnson has suffered from a life-threatening neurological illness that mimics strokes since he was 11 years old. UTA alumni, staff, and close friends surprised him recently with a celebratory pep rally. Watch the video. Apply now to join the Women in Leadership cohort for 2015-16. Applications are due by Friday, Sept. 11. The Women in Leadership program is an opportunity to develop relationships with women who strive to make a positive difference in the community. Last day of classes for summer 14-week, summer 11-week, and summer II terms. Final exams for summer II term. Final exams for summer 14-week and summer 11-week terms. Registration for the fall term continues. Advising is available in your academic department. Classes start Thursday, Aug. 27. The Planetarium's $2 movie returns in August with a film that covers every angle. White Room: 02B3 follows six strangers who wake up in a white room to find out they are part of an extraordinary experiment that could change the face of humanity forever. The first film of its kind, the Roddenberry Entertainment production was shot using a cutting-edge 360-degree camera system. Set in the middle of the single-room set, the camera captures 360-degrees outwardly in high-definition panoramic video with no gaps or distortion. All actors are filmed simultaneously, presenting a unique challenge for writers, producers, actors, and the director. White Room: 02B3 stars Breckin Meyer, Tamlyn Tomita, David Blue, and Rachel True, as well as Internet icons Tony Janning and Milynn Sarley. The movie is not recommended for children under 13. Showtime is 7 p.m. Fridays in August. See the rest of the Planetarium's schedule. The fall schedule begins Thursday, Aug. 27. Discount Rangers Tickets Texas Rangers vs. Tampa Bay Rays. Visit texasrangers.com/grouptickets, click on University of Texas at Arlington, and use the password GOMAVS to get your discounted tickets. Various times, Globe Life Park. Upcoming games are Seattle Mariners, Aug. 17-18; Toronto Blue Jays, Aug. 25-27; Baltimore Orioles, Aug. 28-30. Texas Rangers. UTA Night at the Rangers Put on your Maverick blue for a night of fun when the Texas Rangers take on the Baltimore Orioles. Tickets $10 with student ID. Tickets on sale soon at utatickets.com. 7:05 p.m., Globe Life Park. Student Affairs, College Town UTA, Alumni Relations. Welcome Back Movie: The Avengers: Age of Ultron Rated R. Free admission and popcorn. Concessions for sale. Lawn seating; bring a blanket or chair. Free. 9 p.m., west lawn, Maverick Activities Center. EXCEL Campus Activities. M.S. in Health Care Administration Info Session Learn more about the accelerated, cohort-based program designed for professionals in the health care industry. Register online. 6 p.m., Fort Worth Center. Also, Oct. 8. Business. Outstanding Mavs: A Maverick coach and three athletes earned honors recently. 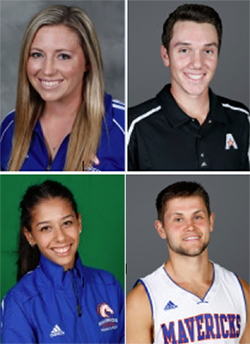 Details are at left about (top, from left) Kristie Fox, head coach of softball; Tanner Gore, sophomore golfer; (bottom, from left) Gabriela Alfonzo, a distance runner in track and cross country; and Drew Charles, junior guard for men's basketball. The men’s basketball team will take on Fordham University in the Homecoming game Saturday, Nov. 14, at College Park Center. Game time will be announced later. A member of the Atlantic 10, Fordham in the Bronx, N.Y., is facing UTA for the first time. The Mavericks return nine players from last season’s 16-15 team. UTA begins its third season in the Sun Belt Conference this fall. The schedule and season ticket information will be released at a future date. Season and single-game tickets for the 2015 UTA volleyball season are on sale at utatickets.com or by calling the College Park Center box office at 817-272-9595. Season tickets are $40 for all 13 home matches at College Park Center, while single-game tickets are $5 for general admission seating. UTA students also have the option to buy the Maverick All-Sports Pass for $25. The pass allows entry to all home athletic events during the 2015-16 academic year, which includes volleyball, men’s and women’s basketball, baseball, and softball. The volleyball team opens the season at home hosting the Maverick Classic on Aug. 28-29. Opponents are Campbell, Grambling, and Texas A&M Corpus Christi. See the full schedule. • Sophomore golfer Tanner Gore claimed his first El Paso men’s city championship last week at Painted Dunes Golf Course. He finished the three-round tournament at 5-under par to post a five-shot victory. • Distance runner Gabriela Alfonzo has received 2015 All-Academic recognition from the U.S. Track & Field and Cross Country Coaches Association. The international business major will be a senior this fall. • Men’s basketball guard Drew Charles was named to the 2014-15 NABC Honors Court by the National Association of Basketball Coaches. The finance junior also has earned two Sun Belt Conference academic honor roll awards and UTA Scholar Athlete of the Year recognition. • Softball coach Kristie Fox joined the junior national team as an assistant coach for the WBSC Junior Women’s World Championship in Oklahoma City. Play began this past weekend.